It is however missing the lid lock that it would have had as a tobacco jar. CAN BE USED AS A NORMAL TEAPOT ( SEE PHOTOS). MADE IN 1915, MARKED ON BASE. IN 'DENBY COLOURS' THEY MAKE UNUSUAL SERVING DISHES BUT YOU COULD ALWAYS HAVE A JELLY PARTY! SOLD AS A SET OF 2. Natural stone colour with screw-in stopper. 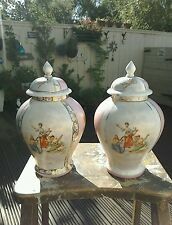 Beautiful old pair of poppy jugs with art nouveau poppy design.I bought these a couple of years ago for flower arranging but due to there age the glaze has crazed and are not water tight however I feel this may put some buyer off but feel adds to the vintage look and is a sign of their age and are still a very pretty and unusual jugs. Large Size makes a Very Impressive Display----also very heavy weighs--1.625 KG. VINTAGE ART NOUVEAU DAISY VASE LOVATT LANGLEY WARE. Natural stone colour. The original stopper has been replaced by a champagne cork. Natural stone colour with brown glaze to the front end and to the stopper. Natural stone colour with black screw-in stopper. A stoneware, salt-glazed cannister or lidded jar in 2 textures and 2 shades of blue. It could even be early Doulton. Just don't know. I will wrap it well with lots of bubble wrap and a strong box. I recycle wrapping materials as much as possible. ART POTTERY 30 CM HIGH VASE WITH CREAM BANDING AND BLUE/GREEN/BROWN PATTERN DECORATION. THIS VASE HAS A CHIP ON RIM TOP [SEE PICTURES]. A lovely Lovatt's Langley Ware England Vase. The top is a deep and vibrant high gloss blue glaze and the lower half has the classic Daisy pattern. The vase is 20cm tall and in excellent condition with no chips or cracks. There is a small inclusion near the rim which I have shown on the pictures. I'm not sure why it's there but it doesn't detract from the overall attractiveness of the piece. Dispatched with Royal Mail 2nd Class. Antique 1 Pint earthenware Jug with Grape Cluster Handle Jug - Langley? Small, 1 pint milk or water jug in brown earthenware. I think I can make out the cursive "Langley" mark, which will date it to around the beginning of the 20th C. It may also be a leaded glaze, so decorative only. This vase has a raised slip decoration on both sides in typical art nouveau design. Rare design. A very pretty and rare shape along with the colour and I have not seen another like it. MARKED TO BASE BUT CANT MAKE IT OUT,LOOKS LIKE IT STARTS WITH A D SO COULD BE DUDSON. THE OTHER IS A SMALL JUG. ART NOUVEAU LOOKING DESIGN TO BODY BOTH SIDES WITH A SMALLER ONE IN BETWEEN THE 2 SPOUT SIDE,BROWN HANDLE WITH WHITE SLIP DESIGN FLOWERS.